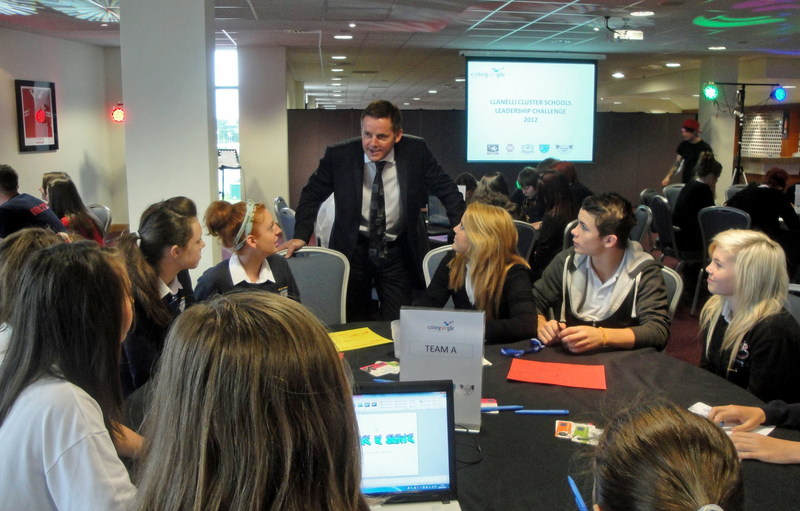 South Wales millionaire and entrepreneur Kevin Green was the guest speaker at the Coleg Sir Gar Cluster Schools Leadership Challenge at Parc y Scarlets, Llanelli. The Dragon’s Den-style event saw children from all the feeder schools for Coleg Sir Gar take part in a competition for the best business idea. Green, 48, gave an inspirational speech to the Year 9 pupils and then joined the judging panel for the event. Eleanor Shaw, entrepreneur coordinator and performing arts lecturer at Coleg Sir Gar, said: “The leadership day was an opportunity for pupils from the Llanelli and surrounding area to meet and work with each other. “The children thoroughly enjoyed the day and the wonderful speech from Mr Green. “It was a busy day with lots of hard work put in by the pupils. They had to put their minds to thinking about a business idea and working on team and leadership skills. “The challenge was – ‘Create a business idea that will benefit the youth of Llanelli by using an empty shop space in Llanelli town centre’. “The children – all from feeder schools for Coleg Sir Gar – got the chance to meet current college students and staff, who helped mentor them throughout the day. “The winners were actually a team of mixed pupils drawn from each school and they came up with the idea of a ‘Fitness Fanatic’ centre. “It was great to see the youngsters working to develop a business idea for an empty shop in Llanelli town centre. “The event is one of the highlights of the academic year for me and for our students. “An event like this works wonders for developing teamwork and leadership skills. At last year’s event, 10 of the pupils went on to become either head boy or head girl at their respective schools. Mr Green said after the event that was hugely impressed by the Coleg Sir Gar project. He added: “It gave the pupils a wonderful opportunity to work on their business and entrepreneurial skills. The school pupils of today are the business leaders and entrepreneurs of tomorrow and it was great to see the youngsters tackling the challenge with such passion, commitment and enthusiasm. “The judging was difficult as they all came up with innovative ideas. We had to pick one winner, but they were all winners. !